It was just about this time last year. 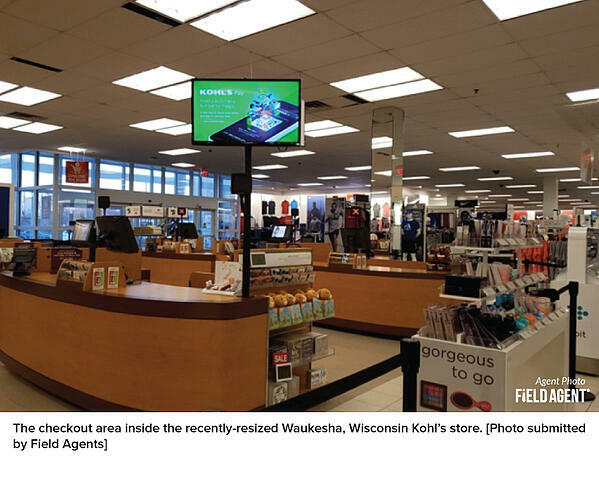 Kohl’s announced it would lease floorspace to discount-grocer Aldi at as many as 10 existing Kohl’s locations, effectively reducing the department store’s increasingly lanky-for-the-digital-age footprint and, in theory, channeling additional traffic into Kohl’s stores. CEO Kevin Mansell said the move would empower Kohl’s "to achieve further inventory reductions and margin acceleration." The announcement was met with wide-eyes by many in the business community, some interpreting the strategic marriage of a popular department store with a discount grocer as a game-changer. 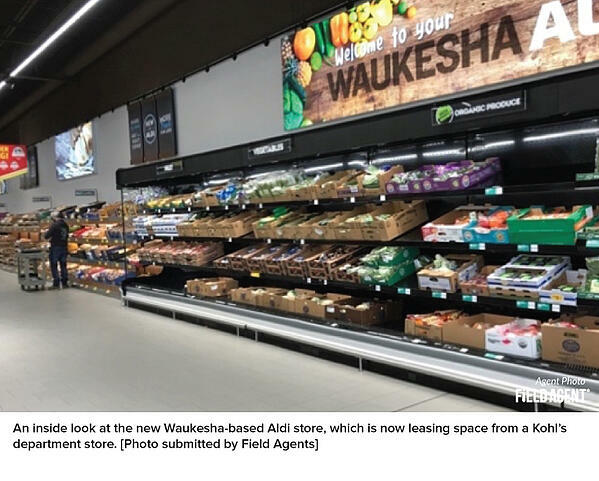 Now, with the first dual Kohl’s-Aldi open in Waukesha, Wisconsin, it’s prime time to consider what shoppers think about this arrangement between two NRF top 25 retailers…and whether Kohl’s strategy will pay off for the department store and its new grocery partner. Crowdsourcing firm Field Agent, a leading provider of retail-auditing, market research, and influencer-marketing services, ran a twofold study earlier this week to understand Kohl’s strategy from the all-important shopper’s perspective. Survey: We then surveyed close to 3,000 shoppers about their attitudes and behavioral intentions toward the new Kohl’s-Aldi “shared space,” generally speaking. Below we offer a 6-question QuickFire Q&A from these efforts. 1. Just how shared is the Kohl’s-Aldi “shared space”? 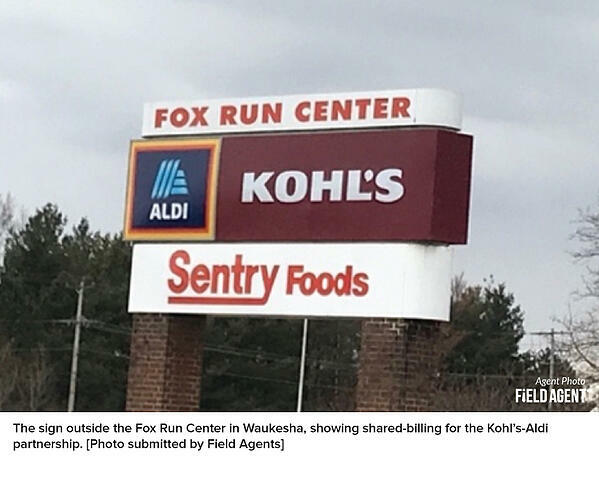 The joint Kohl's-Aldi location has been referred to as a “shared space,” which got us wondering to what extent Kohl’s-Aldi is one store, two separate stores, or somewhere in between. All five answered the same way: 0. In other words, we’re talking two separate stores here. 2. Store size: Too big, too small, or just right? Let’s get to the Goldilocks question—are the stores too big, too small, or just right?—before moving on to some of the results of the larger survey. But to understand the larger implications for Kohl’s and Aldi, let’s turn to our survey of almost 3,000 shoppers. 3. How do current Kohl’s customers feel about the conventional size of Kohl’s stores? And Aldi customers about Aldi stores? In all, 3 of 4 (76%) said Kohl’s stores are neither too big nor too small. Yet 19% said Kohl’s stores generally feel too big, while 5% said they usually feel too small. We posed a similar question to 1,365 Aldi shoppers. 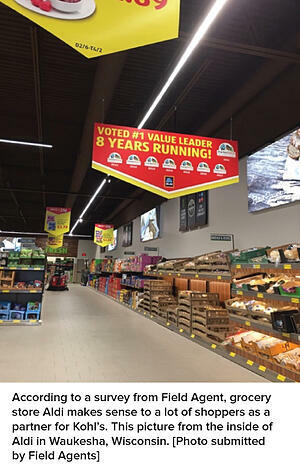 Sixty-percent said the “typical, conventional” Aldi store is neither too big nor too small. But, notably, 37% said Aldi stores are generally too small, and only 2% said they’re too big. 4. How do Kohl’s shoppers feel about the department store’s decision to reduce the size of its stores? That’s right, emoji. I mean, isn’t it a preferred method among Americans for expressing feelings? 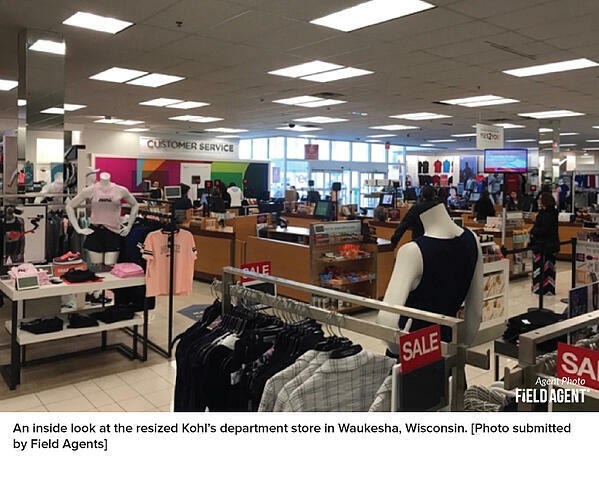 But although the survey results suggest some Kohl’s shoppers may not exactly like the idea of smaller Kohl’s stores, the survey also reveals some promising news for the department store and its strategy. 5. Yeah, but will the close proximity of Kohl’s to Aldi net more footfall for the retailers? After all, that’s the hope…that’s the strategy. The results were favorable for Kohl’s and Aldi. Altogether, 90% of shoppers said they’d be at least moderately likely to shop both a grocery store and department store on the same trip. Moreover, hypothetically, 68% said they'd be either completely or very likely to hit both stores on the same trip and 38% completely likely to do so. Glad tidings. But let’s get more specific. We asked the full sample of 2,957 shoppers how much more or less likely they’d be to shop Kohl’s department store if it was located beside an Aldi. Another 45% said they’d be neither more nor less likely to shop at Kohl’s with Aldi beside it. Flip the script. What about Aldi? Fifty-two percent of shoppers said they be more likely to shop at Aldi, if it were directly next to a Kohl’s department store. Another 43% would be neither more nor less likely. Good news for Kohl’s, Aldi, and the new alliance. 6. Moving forward, which retailer would shoppers MOST like to see beside Kohl’s stores? It’s no secret. Kohl’s is in experimentation mode and wants to test this "good neighbor" strategy with other retailers. Indeed, recent headlines suggest Planet Fitness will soon start renting space from Kohl’s. So the question becomes: If shoppers could have one retailer directly next to Kohl’s, who would it be? We presented several possibilities to respondents: Aldi, Planet Fitness, Kroger, Walgreens/CVS, Dollar General/Family Dollar/Dollar Tree, Barnes & Noble (or another bookstore), PetSmart/PetCo, and Best Buy. Almost 3-in-10 (29%) said that, among the options presented, Aldi was most ideal—easily the most popular option among respondents. Aldi was followed by Barnes & Noble (16%), a dollar store (16%), and a drug store (12%). 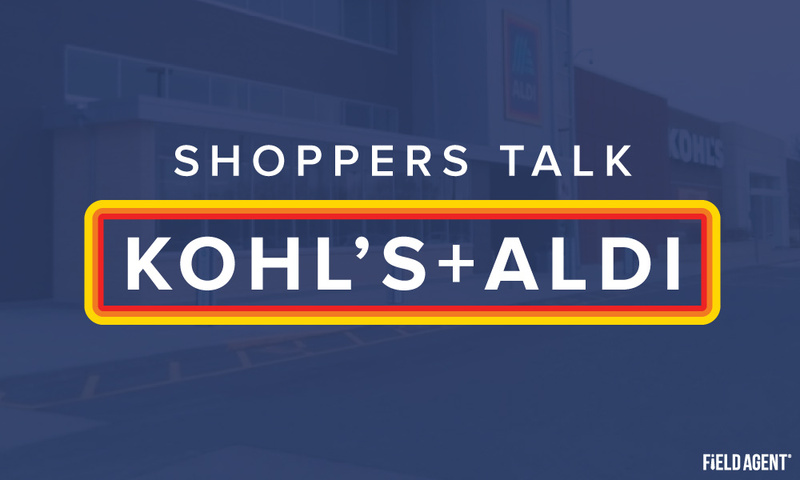 The survey suggests Aldi is a good fit for Kohl's, that is, from the shopper’s perspective. Entering this dual mystery shop-survey, we weren’t exactly sure what to expect from the new Kohl’s-Aldi alliance. On the ground, would we effectively find two retailers operating as one, or simply two separate stores with little-to-no operational integration? Based on images and information supplied by our mystery shoppers, the latter appears closer to the truth. And what about the survey of 2,957 shoppers? What did that tell us? Don’t expect all Kohl’s shoppers to be enthusiastic about smaller stores. Many have grown accustomed to a certain inventory level at Kohl’s and, alas, change is hard. To the extent shoppers can accurately predict their own behavior, expect the Kohl’s-Aldi partnership to generate greater footfall for both stores. In theory, many shoppers love the idea of shopping a popular department store and discount grocer in one fell swoop. How will the next generation of shoppers impact grocery-retail? Click below to download this free report!